I was at my desk in the early spring of 2011 when I got a call from a sports agent looking for information about a new bow for one of a clients. After exchanging formalities, I asked about his athlete's draw length and preferred poundage. When he asked what that meant, I suggested it would probably be best if he had his client call me. A few days later, the agent called again with more specifics: "His draw length is 32 inches, and he likes 80-pound bows." After providing some choices to consider, I asked who the client was. "Justin Tuck. But please keep it confidential. He's a devoted bowhunter, and he watches your shows and reads your magazines." Justin Tuck from Notre Dame and now with the New York Giants? The All-Pro defensive end who won Super Bowl XLII and should have been MVP with two sacks of Tom Brady and a forced fumble? As an avid NFL fan, I knew exactly who Justin Tuck was — along with his list of recent accomplishments. Being a hard-core Steelers fan, I didn't follow his regular season games much, but you couldn't miss his performances in the playoffs and in the "instant classic" Super Bowl XLII against the then-undefeated New England Patriots. Coincidentally, we had a TV filming trip coming up in South Texas for javelina with some industry friends, so I asked the agent if Justin would like to join us on the road. When the agent replied, "What's a javelina?" I told him that Justin and I should talk. A couple calls later and we were booked to rendezvous in South Texas. I warned him that our annual spring peccary hunt was an exceptionally low-key affair: $49 hotel rooms, baloney sandwiches, dinners at locations where the priciest entrees were $10, mostly because that's all there is where we hunt. I wondered how someone of Justin's current means as a multimillion-dollar athlete playing in New York City would handle the spartan nature of this down-and-dirty adventure. I needn't have worried. Within a half-day, Justin was trading barbs with everyone in attendance, hooting and hollering over blown stalks, executing tough shots, and largely having a great time as just one of the group, pursuing a fun-to-hunt animal he hadn't chased before. He may not have made our group of hunters Giants fans that week in Texas, but he made everyone a Justin Tuck fan, mostly due to his obvious love of hunting, graciousness, and genuine personality. Upon returning, we immediately made plans for a future hunt. Days later, everyone on the trip — and their kids — received signed NFL footballs from Justin. Justin went to Africa the summer after our hunt together, taking two massive Cape buffalo and numerous other game — all with his bow. We made plans for a late winter hunt the following year, in the event the Giants didn't make it to the Super Bowl. In the fall, Justin and the Giants made an improbable late season run just to make the playoffs, during a year that he struggled with nagging injuries. As his team hit their stride during the postseason push, he was characteristically upbeat. "I really like our chances," he told me. "This feels a lot like 2008. We're going to have to put our hunt plan on hold." The Giants indeed made it to the Super Bowl, and Justin ended up having a monster game — sacking Brady twice and forcing a key safety on the first play from scrimmage — and collected his second Super Bowl ring. The year after his second Super Bowl victory, we booked a bowhunt to Argentina to chase red stag, water buffalo, and axis and fallow deer. Justin ended up with a very puckering encounter at three yards with a massive water buffalo, all captured on film, and also shot his first axis deer as well as a beautiful fallow stag. The realities of the NFL as a business caught up with Justin in the spring of 2014 when he accepted a generous offer from the Los Angeles Raiders for his services. We both had a burning desire to hunt New Zealand, so with Justin now living in California part time, we decided to book a hunt with our friends Phil Wilson and his daughter, Danielle, of NZ Hunt. 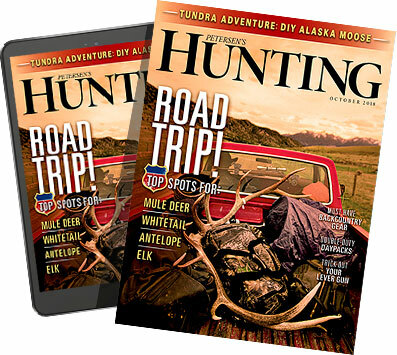 Joining us was Petersen's Bowhunting Editor Christian Berg, who coordinated the adventure. To our surprise, upon arriving in Christchurch on the South Island, one of our guides for the hunt was Remi Warren, host of Apex Predator on the Outdoor Sportsman Group's Outdoor Channel network. Having followed Remi's TV exploits, Justin immediately appointed him as his personal guide for the week — a decision he would live to question later in the hunt. Rarely does a far-flung adventure meet preconceived expectations, but this hunt actually exceeded them. We stayed in a custom-built, bed-and-breakfast and enjoyed great food and libations, awesome guides and camaraderie, and terrific hunting. We all took trophy red stags, and Justin also managed to shoot a beautiful bull tahr and a great fallow stag. At over 450 inches, Justin's red deer was a monster, but Remi made him earn every trophy, testing Justin's lung capacity and vertical endurance as a matter of protocol each day, I think mostly for fun. Being 6'5" and 270 pounds has its advantages on the football field, but it provides absolutely no leverage during daylong hikes up the mountains chasing tahr with a guide who climbs like one. Growing up in rural Kellyton, Alabama, Justin was around hunting his whole life, but didn't take it up seriously until introduced to bowhunting during his college years at Notre Dame. He has a history, on and off the field, of being in the right place at the right time. In high school, college scouts came to watch another local player and by accident ended up at Justin's nearby game; a Notre Dame scholarship offer came shortly thereafter. Justin earned a degree in business management and, fortuitously, met his wife, Lauran, while setting defensive records that still stand at Notre Dame. Lauran, a Philadelphian who holds a master's degree from the University of Pennsylvania, and Justin co-founded Tuck's R.U.S.H. for Literacy, a program that donates money and thousands of new books to low-income children in New York, New Jersey, Oakland, and Alabama. In addition to their own foundation, the Tucks support a number of other charitable organizations, and Lauran Tuck serves on Notre Dame's Performing Arts Advisory Council. A voracious reader and outdoor TV viewer, Justin knows names of all the shows on Outdoor and Sportsman channels. When Justin talks to our staff, he doesn't want to talk football, he wants to talk gear and hunting. Justin officially retired last February after 11 highly productive seasons in the NFL, nine with the Giants, including two Super Bowl wins, and two with the Raiders. A testament to his leadership and work ethic, he served as a captain on both teams. Given his former day job, he could only squeeze in one or two big-game hunts each fall, but he still managed to tackle trophy whitetails, black bear, axis and fallow deer, mountain tahr, plus numerous African game and multiple buffalo species. And he's got big plans for the future, catching up with hunts on all the glamour species of the fall hunting seasons he never could chase until now. Encounters and trips with celebrities and pro athletes can often prove to be a double-edged sword; everybody wants something from these folks to further their own business goals and notoriety. As a result, some of these celebrities end up being somewhat jaded and mercenary, given what's at stake, and the resulting experience isn't rewarding for either party. Our experiences and relationship with Justin have proved just the opposite. In addition to being a true hard-core hunter, he's a genuinely enjoyable person to be around. A God-fearing, family-oriented man who gives back to the community at large, Justin has never forgotten where he came from — and where he plans to go.